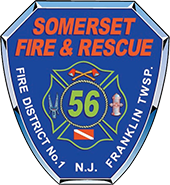 Somerset members practiced bailout recertification training today at Somerset County Fire Academy. This session also introduced our recently certified firefighters to our bailout program. All members present showed exceptional proficiency and confidence in their bailout skills. This continued training allows our firefighters to prepare themselves to escape the possibility of a career-ending situation. Congratulations too all who attended. Fire District No. 1 companies were dispatched to a single motor vehicle crash with entrapment on Canal Road near Suydam Rd. Car 56, Car 562 and Engine 562 and Rescue 56 found a panel truck partially on it’s side with the driver entrapped. Crews from Rescue 56 and E562 stabilized the vehicle and removed the driver’s door to free the driver. The driver was not seriously hurt, the incident is being investigated by the Franklin Township Police, Traffic Division. Fire District No. companies attended the second of four district training events. Each district company hosts one district drill per year. This most recent training event was the responsibility of Somerset Fire & Rescue, the topic Confined Space Rescue. Confined Space Rescue is a very specialized skill and requires the help of all District stations to accomplish. This year we had special guests in attendance. Our friends from Community Fire Company (Sta. 25) were a welcome addition to the training. The drill scenario presented the challenge of performing two separate confined space entries simultaneously. In addition, each entry also consisted of a vertical and horizontal entry component. The crews performed both rescues with great expedience while maintaining the highest level of rescuer and victim safety. Change your clock, change your battery.